Finally, I’m back with a little something to share….. I’ve been busy working on several projects and none of them finished 😦 but here are three quick cards from an idea I played around with a couple of days ago, but first a quick update. Living in New Zealand we are very used to earthquakes – the country straddles a giant fault line and the recent events in Christchurch have revealed a new fault line, which may be moving north, and the reason that the latest events have occurred. My hometown of Wellington, the capital city, has been shaken with earthquakes over the past few days, my eldest daughter lives there and is coping with the endless rocking and rolling, books tumbling off her bookshelves – and she is a book-aholic with bookshelves in just about every room…… Work takes both ED and her partner into the central city with it’s high rises which is always a concern when the earth decides to move! Needing a bit of a stress relief, it was time to do something relatively mindless…….. 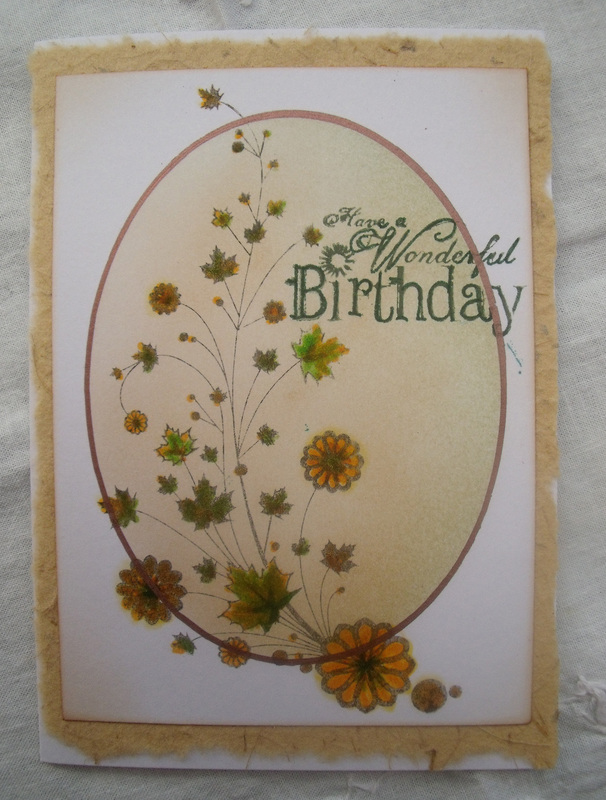 I made an oval template and filled in the colour with distress inks, stamped, then coloured – colouring in for grown ups, it is so relaxing! Then I added the greeting and finally matted and mounted. All done in less than an hour. Thanks for dropping by, hope all goes well for you! 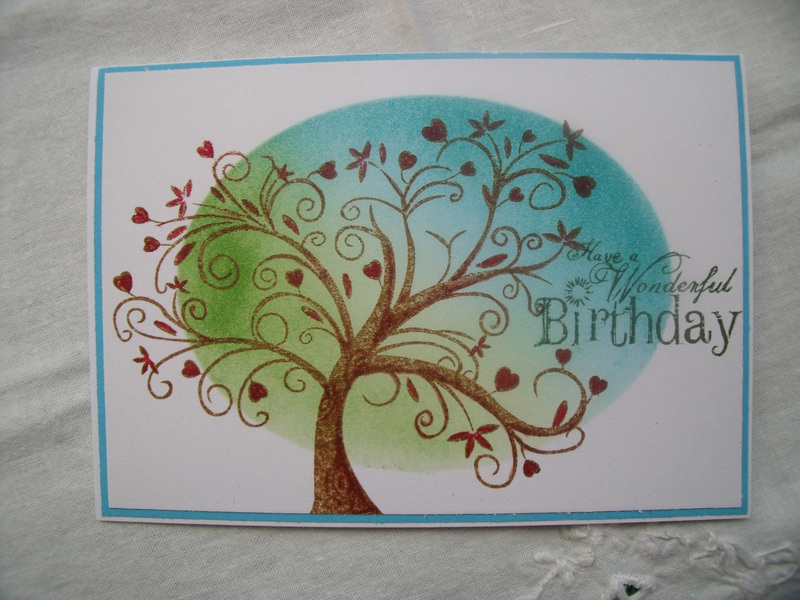 This entry was posted in Creations From My Craft Room, Current Events and tagged Cook Strait, Earthquake, easy cards, Fault (geology), New Zealand, paper crafts, Wellington, Wellington earthquake by thecontentedcrafter. Bookmark the permalink. These are really divine! That tree is just gorgeous. Isn’t it! A newish stamp in my stash and it’s a favourite already! Glad you liked them! Waving and smiling 🙂 Thank you! 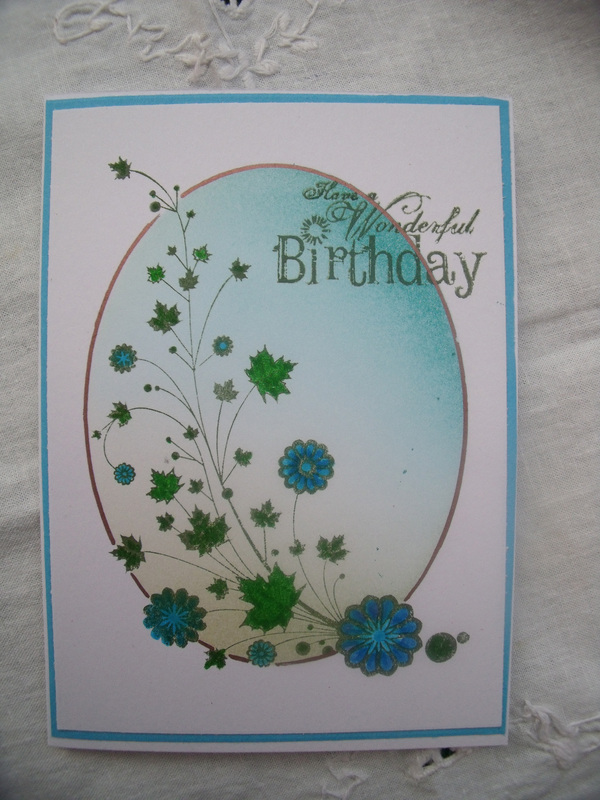 Loving your cards, especially the stencilled ovals with the colours all blended so nicely. Be safe o’ crafty one. Thankyou! Canada has always appealed ……. getting more appealing by the minute! Nicely done! It’s good to have these creative outlets, especially when under stress. I live in California so we are no strangers to earthquakes. The worst I experienced was in 1989. I remember it well. Best of luck to you and your daughter. Beautiful cards, as always, you did a great job! Wow Pauline, four things . . . Love the cards. You make them look so easy to make. Wish I got one for my birthday. And is it like a constant rumbling, the earthquakes? Is it on and off throughout the days? We’re fairly used to earthquakes but they only come when its real serious. Thank you Char! And no, not constant rumblings – the big ones are always noisy though, mostly I guess from the buildings shaking and moving… though I have been outside in one and heard it coming, like a train – that was a big one a few years back. The after shocks can go on and on and test your nerves. I believe there have been in excess of 80 smaller quakes since Saturday. Sometimes the smaller quakes do more damage as buildings are weakened in the big one and then the constant rock and roll wears ’em out …. There is nothing you can do, nowhere to hide. Keep calm and stay as positive as possible! We are hoping it will not be a repeat of Christchurch! Yeah, no we wouldn’t want that . . . at all!